Ray Hunt, the past President of the Houston Police Officers Union Endorses Judge Maria T. Jackson. Joe Gamaldi the current Houston Police Officers Union President Endorses Judge Maria T. Jackson. Kathryn Griffin-Grinan the Founder of We've Been There, Done That Program Endorses Judge Maria T. Jackson. ATTENTION! 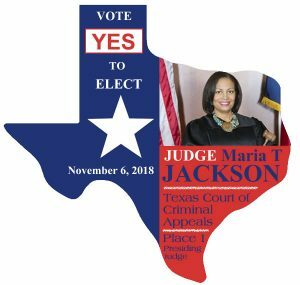 Important message from Judge Maria T. Jackson about early voting! Thank you! #VoteForJackson!